Find out what happened to a guild member on his last mission. Found him. So what's the problem? Talk to Galan Brandt to receive your next quest. Head to Nassudan and find Mashug gro-Dugal. Galan Brandt has some disturbing news. Mashug gro-Dugal, whom he describes as "one of the finest guild members the Firewatch branch has ever seen" has disappeared. His orders were to eliminate a necromancer inhabitant of Nassudan, but he never returned. Brandt orders you to investigate and either find gro-Dugal alive or take vengeance on the necromancer. To reach Nassudan, head out of Firewatch's north gate and follow the valley until you reach the end. Keep heading north west and the familiar dome of a Velothi tower should become visible in front of you. Finding Mashug gro-Dugal is no great challenge - he is standing quietly on a platform in the first room you come to... but there's a problem. He explains that he cleaned out the tower without trouble but that he has now activated a trap, which he demonstrates to you. Unless there is somebody standing on the platform, an impenetrable barrier blocks the only exit from the room. The barrier also blocks teleportation. He tells you to return to Firewatch with the news and ask Galan Brandt to come up with some method of rescue. Although you can return to Brandt with the news, it is possible to rescue gro-Dugal from his captivity. The clue is in the orc's explanation of how he triggered the trap: he tells you that a daedroth was standing on the platform when he arrived and was keeping the door open. There are several creatures still alive in the lower levels of the tower. Get one of them to chase you and lead it up onto the platform. Quickly tell gro-Dugal to wait for you by the exit and wait until he walks out of the room. When your chosen creature is fully on the platform, cast a Calm Creature spell on it. The weight of the creature should keep the door open while you run for the exit. You need to talk to gro-Dugal and leave the tower before your spell wears off or, with absolutely no common sense at all, he will run back into the trap room and start attacking your creature. In addition, if you can summon a creature for long enough, get it onto the platform, and paralyze it, the door will stay open, and you may both leave. Once gro-Dugal is safely out of the tower, return to Galan Brandt for your reward, which is entirely in the form of thanks. If you left gro-Dugal in the tower, you receive a five point disposition bump and one Fighters Guild reputation point. If you managed to rescue him, Brandt's disposition increases by 10 and you receive two reputation points and three guild reputation points. If you can't free Mashug gro-Dugal, don't feel too bad: there is a chance to rescue him in a later quest. 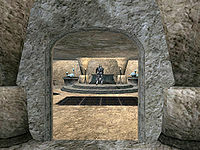 10 Fellow fighters guild member Mashug gro-Dugal never returned after leaving to carry out his latest orders, to rid Nassudan of its necromancer inhabitant. Galan Brandt has asked me to determine what happened to him. 20 Mashug gro-Dugal has triggered a trap at Nassudan whereby it is only possible to leave the stronghold if someone else is inside. Teleportation also doesn't work. He's asked me to report his success to Galan Brandt and just leave him until someone can figure something out. 100 Finishes quest I told Galan Brandt that Mashug gro-Dugal was trapped in Nassudan. He thanked me for checking and told me he'd try to find a solution. 105 I managed to free Mashug gro-Dugal from Nassudan. 110 Finishes quest Galan Brandt was thrilled that my quick thinking was able to free Mashug gro-Dugal.